The HP printers repairs are listed below with its solutions. The common error messages that occur on this printer are blinking lights on the printer and the ink cartridge errors. If an ink cartridge error occurs, replace the problematic ink cartridges by using HP Printers Repairs guide. Open the ink cartridge access door and identify the problematic ink cartridge. Refer to the steps below to replace the problematic ink cartridge. Get the genuine HP ink cartridge from the manufacturer and install it into the printer. Take the ink cartridges out from the package and install them into the slot. Check if it is located properly in its place. Remove the problematic ink cartridge and reinstall it into the slot if it is not located correctly. Close the cartridge access door after ensuring the ink cartridge is locked properly. Try to print and see if the ink cartridge problem is resolved. The common HP Printers Repairs and issues are provided here with solutions. If no lights are On when the printer is turned on, wait for 5 seconds. This is because the printer is preparing to function and initializing memory. After 5 seconds if the power light does not come on, the printer might need to be serviced. The printer is preparing to print if the Power light is flashing. When the printer has received all data, the light stops flashing. Check the following conditions if the Resume light is flashing. Check if there is enough paper in the printer. If the paper is not loaded in the printer, load it. Press the Resume button and the paper jam might exist. Use the instructions in the manual to clear the paper jam. If the print cartridge light is on or flashing, use these steps to resolve the issue. Two print cartridge status lights will be present on the printer. The left light indicates to the left print cartridge. Right light indicates to the right print cartridge. Open the printer cover and then remove the print cartridge on the right. Close the cover and check if the light is flashing. If yes, then open the printer cover and replace the print cartridge. Remove the other print cartridge and check if the light stops flashing. If the light stops blinking, then the problem is with the print cartridge. Try to manually clean the print cartridge. A small amount of debris can deposit on the print cartridge contacts if the printer is used in a dusty environment. Perform the following procedure to manually clean the print cartridge. Open the printer cover and check if the print cartridge cradle moves to the right side of the printer. Remove the print cartridges and then moisten a cotton swab with distilled water. Wipe the copper contacts present on the print cartridge and repeat this step until all the ink residue or dust disappears on the swab. Reinsert the cartridge into the printer after cleaning the print cartridge. When both the lights continue to flash, either the printer is the problem, or both the cartridges have problems. 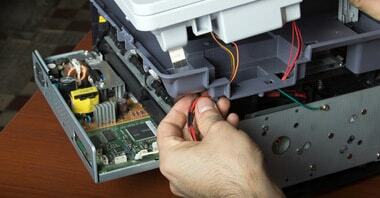 The print cartridge should be replaced or the printer should be serviced by using HP Printers Repairs manual.